Enchanted Garden, a collection of original Debussy and Ravel transcriptions* for flute and piano, is available now on CD. 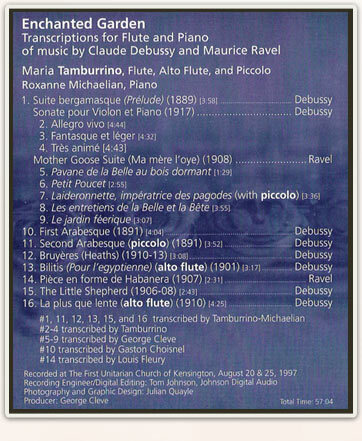 The album is full of lush, exotic music, including premieres of new flute arrangements of Debussy’s Violin Sonata and Ravel’s Mother Goose Suite, plus Debussy’s First and Second Arabesques and several other pieces. Pick up your copy from one of the vendors below. 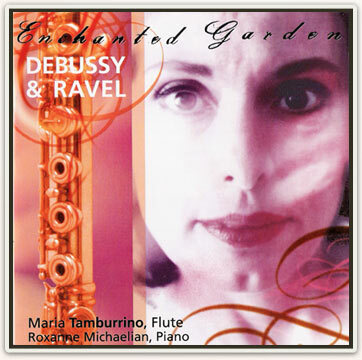 Maria Tamburrino, flute, alto flute, and piccolo and Roxanne Michaelian piano. Produced by Tamarin Productions. Enchanted Garden is currently not for sale.